A video of a debate between Mary-Lou Donnelly of the Canadian Teachers Federation and International Game Developers Association Executive Director Jason Della Rocca over calls for a boycott of Bully: Scholarship Edition has been posted on the CBC website. The Teachers Federation recently called on retailers to boycott the sale of the game, claiming it encourages bullying among kids and undermines their efforts to eliminate violent behavior in schools. In an interview with the Globe and Mail, CTF President Emily Noble said she wanted retailers to be responsible, adding, "Yes, they can sell it and make a buck out of this, but is this the kind of marketing that they want to be (doing), selling games that glorify violence?" Donnelly, vice president of the Federation, said in the debate that Bully "trivialized and glorified" bullying, and claimed that it desensitized students to violent behavior by normalizing it. While she admitted she had not played the game herself, she said she had seen trailers for the game, and that the Teachers Federation had brought in students to play the game for them while they watched. 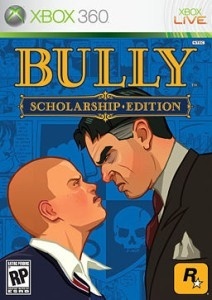 Della Rocca, however, accused teachers of not doing their homework, saying the protagonist in Bully: Scholarship Edition was actually an "anti-bully" who defended weaker students and girls from hallway predators, and also had to do well in classes in order to progress through the game. "Teachers are missing an opportunity to use a game like Bully to open a dialog with the students," he added. Bully: Scholarship Edition, for the Xbox 360 and Wii, is an updated edition of the popular 2006 PlayStation game Bully that features new content, unlockable items, minigames and more. The Xbox 360 release also includes online multiplayer options. The full, albeit brief, debate is available for viewing on the CBC.